Pioneer launches two new wireless Bluetooth speakers | What Hi-Fi? 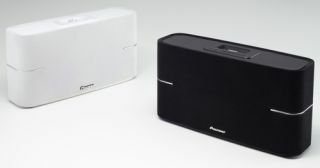 Pioneer has launched two new wireless Bluetooth speakers, the £70 XW-BTS1-K/W and the £100 XW-BTS3-K/W. The larger BTS3 has an integrated iPod/iPhone as well as Bluetooth, and has a video output for connecting to a TV and an aux input for playing non-Apple devices. Dual 3in speakers are housed in a wooden casing and driven by 30 watts of power. The BTS1 weighs in at 1kg and features the same Bluetooth technology but no dock. There are two 2in speakers and 10 watts of power. The XW-BTS3-k/w will retail for £100 and the XW-BTS1-k/w for £70. Both are available now in black or white.